Sometimes it feels like a secret society, this adoption thing. 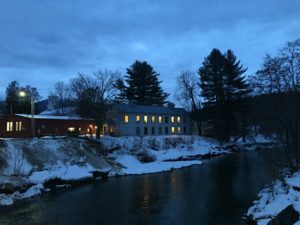 I’ve been at a writer’s residency the past month at the Vermont Studio Center, and as I read from my book manuscript a couple of weeks ago, I looked out at the faces in the audience. I know that whenever I read from my memoir afterwards, either right away or in the coming days, there will be whispered conversations. People tell me their stories–or maybe not the story at all–just that they are a birthmother or an adoptee. I’m still thinking of the young man who waited until the day before he left to tell me how much he appreciated the reading. “I’m a child of adoption,” he said. I saw loss and longing and questions in his eyes. The intensity of it threw me off balance, and I had one of those moments wherein I tried to say something right and good, but because I was trying so hard, I can’t remember what it was I said. I would have liked to have said that I’d bet a million dollars that his mother loved him and has missed him every day of her life. This entry was posted in adoption, birthmother, family, grief on March 27, 2018 by declemen. How well I can relate. I surrendered my child 52 years ago and while life went on and I was successful professionally I was a mess internally secretly, and beyond alone. As I can’t remember some fairly significant specifics and I asked my doctor why and she told me it was PTSD. I was totally abandoned at the time. My daughter and I reunited 5 years ago I am happy to report and have a good (& grwing) relationship. I am 72, have no other children, and married for the first time 9 years ago. Trust became impossible for me. I have a wonderful husband and a good life, but in many ways feel cheated. Looking back, it is impossible for me to decide if I did the “right” thing, because my daughter is very well educated, has a wonderful career and family life, the likes of which I probably couldn’t have afforded her. Myself, I am forever regretful of the decision. I felt like I literally had no choice, and feel perhaps had I been braver I could have managed to keep her somehow. I don’t think I will ever totally forgive myself. Society was hugely different then as any first mother from the BSE knows so well. I find it ironic what society now has become. Personally I now think it is wrong to ever surrender a child unless there are extreme reasons for it. The cost is too high and forever painful in my opinion. Oh my gosh….your reply embodies all my feelings. After fifty years, my son found me, and I am still ( just two years reunited) processing the facts of my split personality ….that I was functionally unaware of! It is so difficult to no realize what a lie I have lived for my whole life….who would I really be if I hadn’t severed my innocent young personality from my shamed existence. I also had a good life as did my wonderful son…..but the complete separation of mother and child is almost too horrific to comprehend. “Beyond alone” captures the feeling of just wanting ‘things to be over with’ of just enduring everyday with this hole in your heart. Constance West I could hug you! Would love to connect with you somehow. Wow – I think you’ve nailed it: “A secret society – this adoption thing”. I’m a mum in Australia who lost her son to adoption. Even today adoption and loss are mainly whispered matters. Heart breaking stuff. Perhaps it’s time to begin shouting. Much has happened in Australia to change things but I don’t think there’s enough shouting. Too many whispers and broken hearts. My heart goes out to everyone who loses their child in this way. As a birthother only recently reconnected with my son, now in his 30’s, I’m all over the shop emotionally and mentally. On the one hand, the pure joy and relief at learning your child is well and happy and, apparently, harbours no ill will towards you is offset by the very real fear of meeting, learning a lot about their lives and they yours, only to be ‘ghosted’ at a later stage by this stranger that really owes you very little. I know this is the worst case scenario but a very possible outcome nonetheless. I’m heartened to read stories that have resulted in relationships being forged. I just wish there were more support groups for our ‘secret society’ to share our hopes and fears with others who understand.